Fee: $35 - Includes T-Shirt, wrist bands, refreshments, snacks & Live Results & FREE finish line photos! Awards: Medals will be awarded for the winners of each age category. ALL children that participate in the Children’s 1K portion of the 5K will receive a medal! 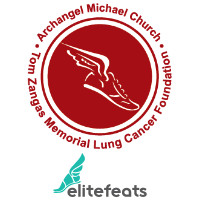 The Tom Zangas Memorial Lung Cancer Foundation was started in 2011 by Leonard and Penelope Zangas to honor the memory of their son, Tom, who died at the age of 40 after a valiant fight against lung cancer. Since its formation, the Foundation has donated hundreds of thousands of dollars to support lung cancer research at leading medical research institutions.